Waking up to a misty winter morning, aware of my wife’s breathing and the sun gently stroking the window blinds. While the girls are still asleep, I sneak to the kitchen for my usual strong coffee day-breaker, knowing the dogs’ welcoming sounds. Even before the see me, their tails drum excitingly on the kitchen floor and against the cupboards – as if they have not seen me in weeks. Armed with a red coffee mug, I quietly step out on the deck. The early sunlight is partly hidden behind Stellenbosch mountain and embraced by a thick layer of mist. The trees close-by appears to stand guard against the moist air. Those further away have been surrounded by the grey and white cloudiness and surrendered to the loving damp. Wandering around the house corner, I disturb a few black birds and they sound the alarm to their fellow worm-seekers. The shrill sounds and flying wings adds to the wonder of the morning and join the unseen feathered ones celebrating the start of a new day with different melodies. How the seasons have changed. 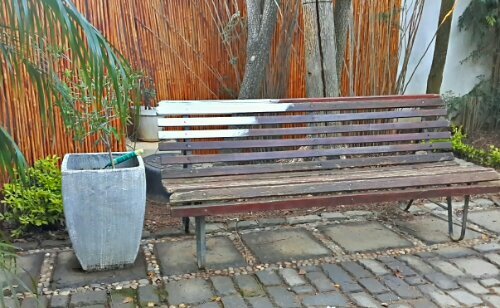 Finding a dry spot on our half painted wooden bench (it really needs some loving care to soften time’s scars), I find the warm black liquid almost therapeutic. Daybreak’s display of colours and sounds treated my senses. Coupled with the sense of being blanketed by cloudiness, the caffeine brings my palate to life and the smells activities my awareness of being awake in this moment. These are precious moments. Stillness. The quiet without is parallel to that within. I am with me. I am with the birdsong, the mist, the moist that drips lightly from the Johannesburg Gold’s leaves. I am embracing the warmth of the coffee mug, as it provides warmth to my body with every sip. I am alive. I am. I am connected in my solitude with my sleeping wife and daughters who are unaware of my thinking of them. I am because of them. I am aware of my, and their, limitations. I can’t always be the father I would want to be . Or whom they may want me to be. But I am blessed to be a father, ‘n pa. Even more to be their dad. In my own imperfect ways to love them and to be proud of them, even when I disappoint with an unnecessary harsh word or working yet another late night. Maybe I am like this bench. Scarred by a few things what life has thrown my way, but also enriched by what I have encountered along the way. Whereas I wandered into the beauty of the morning today, the old bench lives through it every day. Sees, hears and feels the cycles of life in every moment, but also bears the scars of the wind, rain and heat. I am a tad jealous, as I just stumble into the beauty of this moment. Maybe the lesson is to be more aware. Not only to nature’s invitations to open my senses to the wonder of every moment. But also to be aware of my family’s beauty and wonderful abilities to love and to grow into the people they are meant to be. I am at times only a spectator to their journeys. But what a privilege to stand on the side-line and to openly or quietly cheer them on to embrace challenges. To deal with their uncertainties. To discover their talents. To see the beauty I witness in them. More importantly to recognise their own beauty. I am blessed to be a dad, to be their dad. Off the coast of South Africa, at least 37 species of whales and dolphins can be found. This fact blows me away. 37 species? Most of these (especially the whales) are found in the about 500 kilometre stretch between Cape Town and the Garden Route. Tthe most famous are the southern right whales, humpback whales, and several coastal dolphin species. These are joined by African penguins and Cape fur seals, with the obvious big and small human shapes enjoying the seawater and surf. A few blogs ago I mentioned a visit to a small town called Betty’s Bay (not far from Hermanus, the whale capital of South Africa). It was here that I experienced one of those amazing life affirming whale moments. I was standing outside on the stoep (our local word for porch) when I suddenly saw a black movement in the water. I just yelled, “Whale!” to get my family’s attention, grabbed my camera and run down towards the sea for a close-up shot. Now, if you ever find yourself in a similar situation, I leave you with 2 recommendations. (1) Familiarise yourself with the territory and (2) Footwear, footwear, footwear. Unbeknown to me was that the 50 meter between me and the shoreline included a gravel road (the easy bit), thick undergrowth of fijnbos and surprisingly a stream (due to a lot of recent rain). That was even before the rocks that provided the soundtrack to the experience and lifted a salty taste and smell into the air. This short, but tricky, distance was made complicated by my foot attire. The old faithful pair of Fatface flip-flops was getting slippery and muddy, making my rock scramble probably amusing to look at, but not fun when trying to run in a whale. My guide in all this was Anneén standing on the stoep lookout. Shouting directions and pointing to where to scramble. I then realised that “nearer” does not translate into “better view”. Every now and then I would see water spurting out, a black back or bit of tail. It was a truly amazing experience that I tried to capture on camera. However, each photo appeared like an ocean still-life, with no evidence of whale. To make matters worse, when I returned home, I was informed that there were 2 whales … I did even not notice the second. The next day in Hermanus, we had breakfast with the most amazing backdrop. Not only did we have a 180 degree ocean view, but we could see several whales (or bits of them) in the bay. Some swimming with new offspring; showing of their tails and playfulness. Luckily they were far enough away for me to even attempt to catch them on film! Do whales get ill, do they get tumours? I do not know. I have heard that they can get (oddly enough) dolphin pox and arthritis. Elsewhere I read that a whale stranding might be due to a boat injury or brain parasitism. 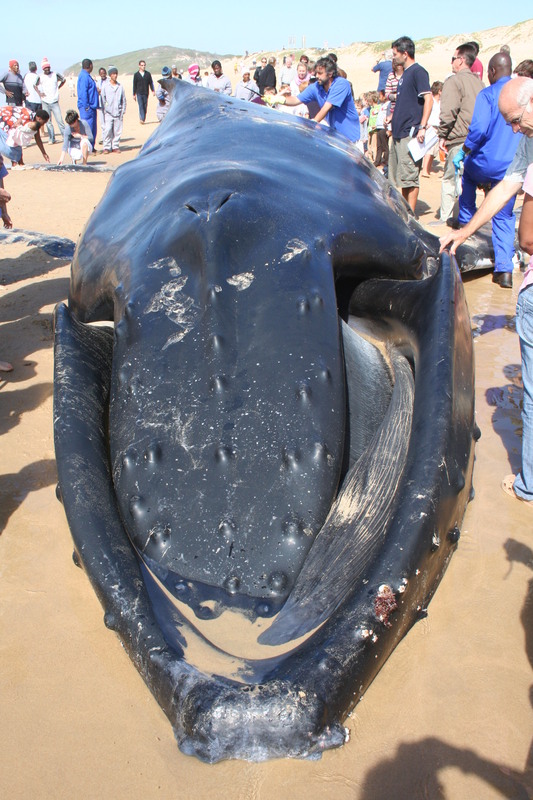 However, the appearance of a very young whale on the beach with no sign of disease might be due to separation from its mother. In the 1978 a book called “The Tumor in the Whale” was published. Rather than it being a collection of medical or marine scientific facts, it is about urban myths and legends. Its author Rodney Dale, a collector of mythical stories, referred to whale meat being sold in wartime England when other meats were scarce. The details of a “specific” person finding a tumour in his meat are quite gross (I would rather not repeat it ) and might be behind the rhyme, “Whale meat again; Don’t know where, don’t know when …” This is referred to as a ‘whale-tumor story’. In essence it’s a wild story with no truth behind it. The type of thing that happens to a friend of a friend of a friend. 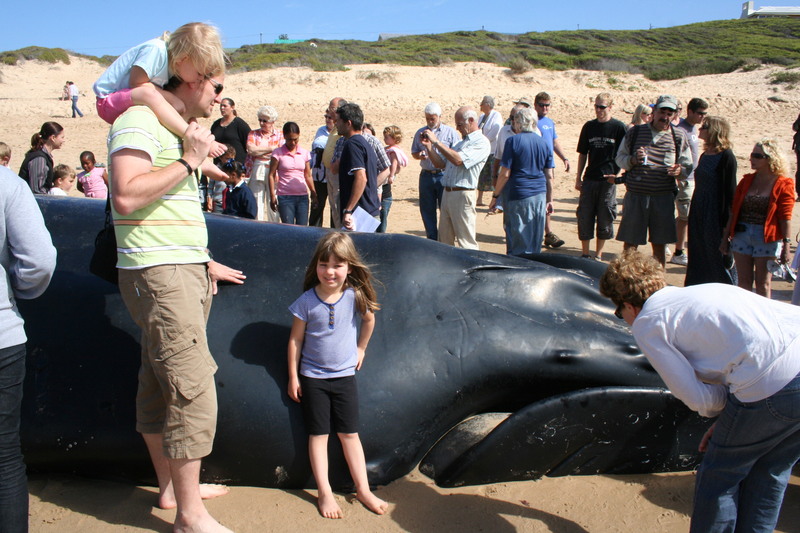 A true whale story happened to us in 2008 while we were visiting my in-laws (we were still living in the UK at the time). 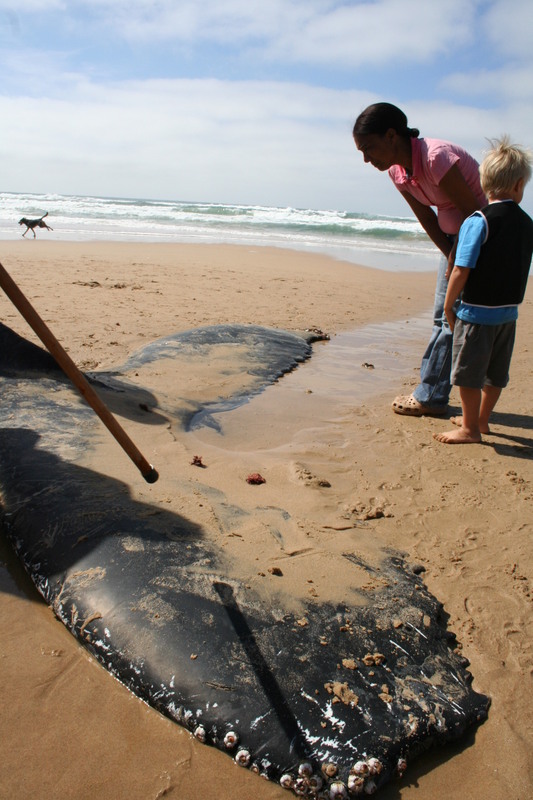 Early one morning the local radio station reported that a whale beached nearby overnight. We took the kids and set off to witness this first hand. It was a truly amazing experience, obviously filled with sadness. The gentle giant looked healthy, almost as if sleeping. The only sign of injury or trauma was a small wound next to his right eye. Local fishery experts did not feel that it could have been the cause for its demise. From the outside, nothing else appeared out of place. Apart from it being a whale on the sand. And it not sleeping. It was still a memorable experience, to be able to touch a whale’s skin, to get a perspective on how small we are next to him/her and how these giants of the sea can be so vulnerable. Moments like these tend to draw us away from, out of ourselves. The moment that we encounter something different, unusual or beautiful. Events that place things in a new context or perspective. How we are small insignificant particles or how we can be instrumental in change and something bigger. These experiences can be quite mundane, like watching a gecko climbing up a wall. Someone walking past you smiling while listening to their iPod or the early morning sunrays reflecting off the dewdrops of vineyard leaves. It can be as life changing as the news that a healthy baby is coming. The beauty in these moments, even if they contain an element of sadness, touches something deep inside me. Feeling removed and connected with something so different. While knowing they must have their own moments of joy and suffering, their own experiences of anxiety or encounters with beauty.